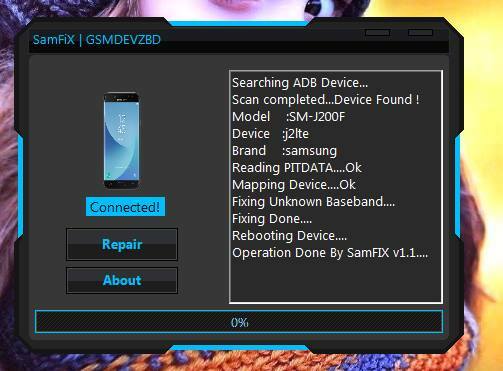 Sam Fix Tool v1.1 WORLD 1st One click Repair Baseband Unknown all samsung devices 2016-2017 and other New Devices.This Tool is Developed by Murad Ft and Mushfiqur Rahman Ayat so all credit goes to them . This tool was premium but on our request they sacrifice this tool for free. but they lunch sam fix v1.2 but before use this version you need to buy it form them. On this page we arrange Sam Fix Tool v1.1 free for all user and our valuable visitor . ⇒ samsung Baseband unknown fixer. Keyword Master: Welcome to Anyromfree Official website . we are happy to see you on our site.Anyromfree is the best website to download any smartphone official stock firmware,Custom rom,usb driver,Flash tools and learning point how to flash any device. we do not use any password to our file and free to use. Anyromfree always try to provide tested firmware and tools that helps our visitor. All firmware are tested before upload. if you like our file so please share with your friends. to get daily firmware update join us our official facebook page and Follow us on Twitter. it you get any problem or bugs so please do not forget to tell us on comment section or mail us to Email Us .Our most popular keyword is flash tools,mi unlock tools,frp unlock tools,firmware without password,samsung frp unlock firmware,flash file without password,android fastboot frp reset tool.